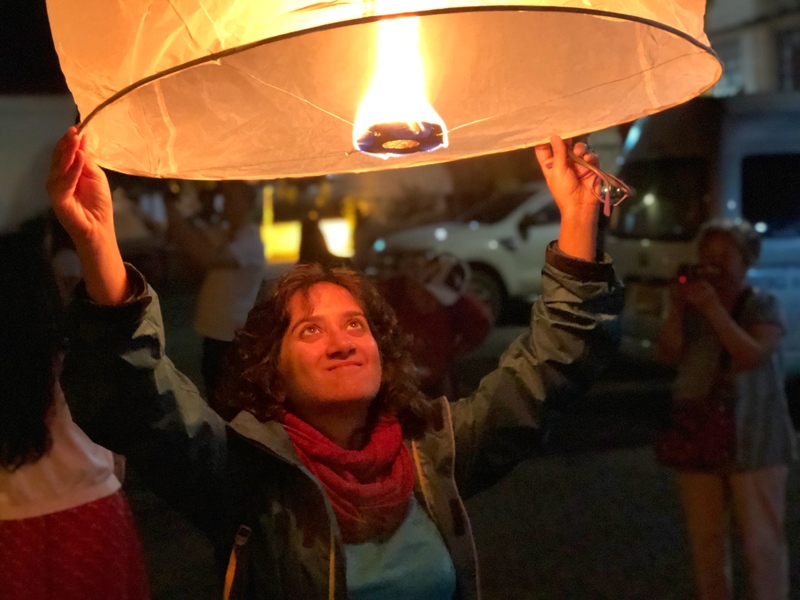 About this post: On New Year’s Eve in Chiang Mai in 2017, I found myself at the Chiang Mai lantern festival, flying paper lanterns on 31st December as the clock announced the New Year – something I never should have done. In this post, I’ve penned down the harmful environmental impact of the Chiang Mai lantern festival, and why I don’t recommend celebrating it. Last year, when I first heard of the lantern festivities on New Year’s Eve in Chiang Mai, I was smitten. I mean, with those gorgeous images floating all over the Internet, it’s hard not to be. So with thousands of others, I made my way to Tha Phae Gate at midnight, scribbled a wish on my lantern, and released it with the midnight countdown to New Year. From where I stood, the sight of thousands of fire-lit lanterns floating in the night sky looked gorgeous. I wrote about it on my blog and hoped to be there again on New Year’s Eve 2018. But in the interim, I learnt about the terrible impact of these seemingly harmless lanterns floating in the sky – and witnessed it myself. Last month, I unexpectedly found myself on a Bangkok rooftop, unaware that it was the eve of the famous Loy Krathong festival in Thailand. From the 41st floor of the high-rise I was Airbnb-ing in, I could admire the entire skyline of this rapidly growing city at sunset. But that evening, the setting sun was trapped in a haze and visibility was drastically reduced. A thick layer of smog hung in the air, obscuring my view – much like it often hangs in the Delhi sky, creating a grim ‘end of the world’ kind of scene. A bad traffic day? I wondered. Just then I saw the cause – a handful of floating lanterns, emitting a dull yellow light, pierced the smog and drifted towards the horizon. It suddenly hit me that the lantern festival of Thailand is a lot like Diwali in India. On the ground, the lanterns and crackers seem harmless, fun, even beautiful. They seem to light up the sky and our hearts… but both are equally terrible for the Earth and our lungs. Turns out, even though many of the lanterns are made of eco-friendly rice paper, they also have non bio-degradable parts. A large metal wire and a big chunk of wax, for instance. The wax burns for a long time, emitting CO2, causing air pollution and smog. The kind I personally witnessed in the Bangkok sky. The sky lanterns, even as seen from the ground, have a long and unpredictable trajectory. They will travel in the air, with the wind, as long as the wax within propels them. The risk of setting a tree, house or farm on fire is very real. Some will fall in canals, some in fields and farms far away. Some will flow out to the oceans, some will be cleared away. Even the ones that are cleared away, will be cleared from sight, but will probably end up in the ocean someday – as pretty much all non-biodegradable trash does. The irony is that the Thailand lantern festival – a combination of Loy Krathong (floats on the water) and Yi Peng (lanterns in the sky) – has its origins in paying respect to the water spirits. When I set my lantern adrift last year, to the beat of drums, with the help of an orange-clothed monk at a small shrine in Chiang Mai city, it felt like I was doing what locals have always done. But now that I’ve researched it further, I’ve learnt that the tradition of lighting sky lanterns originated in small farming communities in rural parts of northern Thailand – where locals would set their lanterns afloat at noon, in their vast farming fields. And presumably account for the minimal trash later during the day. According to this article by the Bangkok Post, the lantern festival was introduced to Chiang Mai and other parts of the country only in the early 2000s, as a means to attract tourism! To put things in perspective, it is worth noting that sky lanterns had begun gaining popularity in many countries around the world – during weddings and other celebrations. But given the risk of the fire they can cause, the waste they generate and the smoke they release, many parts of Europe, South America, China, UK and nearby Vietnam have banned these lanterns. I’m kicking myself for not doing enough research last year and becoming part of a tourist festival that is creating enormous waste and pollution in a city and country I love. Even though I’m likely to be in Thailand on New Year’s Eve 2018, I definitely won’t be spotted at the Tha Phae Gate in Chiang Mai, for those sky lanterns, floating into the night sky, will only remind me of how poorly we’re treating our beloved nature, environment, animals and the ocean. Have you ever taken part in an environmentally or socially harmful tradition on your travels – and regretted it? It’s time we speak up and let others learn from our mistakes. Thank you for writing this Shivya. Even though Lanterns are a big part of traditional festivals of IndoChina region, these days they are overused by tradesmen from travel Industry. Not only smoke, they create havoc for the avian species too, precisely the reason I stay away from lighting trends on CgriChris and Diwali and urge my friends and family to do the same. So far, I have found two lighting festivals staying True to the root at large. One at Luang Prabang, Laos.i think the festival is called Lai Heua Fai. Basically locals render their respect for Mekong river, the mother of the region. The lights are floated in banana leaves and cane made small arrangements (the one they use for Baci ceremony) and it is a sight to behold. The Fanush festival in Kolkata too is a great initiative to introduce Noisefree Diwali .it was a part of old school Babu culture and void of plastic, does not cause smog (yet, because not everyone does it). Yes, these lanterns getting popular day by day. But yes I understand the hazards they create to our nature. I don’t take part in any activity which degrades our natural surroundings including the firecrackers (which we did in childhood) during Deepawali (Diwali) festivals. Btw great post Shivya! Thanks for sharing, I had no idea of their impacts of using the lanterns, I feel the same about fireworks. Hope at some point we understand how dangerous are some traditions. Wow, I didn’t know that. I had considered going to the Yee Ping lantern festival last month, but didn’t make it. Now I’ll have to think twice. I found it particularly interesting that it was only started recently to attract tourism. Thank you for your insightful article. Hey I think that this is a great festival. However, what you are explaining in your post also holds quite a great importance. It’s really nice that you importance environment. What a nice information, I know that the event is very beatiful and famoust but like what you write on this website this activation is very harmfull for our environment. Btw why do you like to end the years in Thailand? Thank you so much for such article which spread awareness among people for the environment. I seriously appreciate your work on the grounds of your experience…Keep the ladders going up,Shivya. You learn something new everyday – especially the part about how the lantern festival is not an age-old tradition but as as tourism product! Previous PostIncredible Ways to Experience Sri Lanka. Next PostUnusual Solo Travel Destinations to Feed Your Adventurous Spirit.